Debt buyers are organizations that exist in large part solely to buy charged-off debts for pennies on the dollar and then turn around and try to collect those debts from consumers, either through letters, calls, lawsuits or, if needed, bankruptcy proceedings. Why would an organization buy old debts? Because it is big business and very profitable. 900 % Return on Investment! In LeavenLaw's experience, settling a debt owned by a debt buyer is easier because of the above illustration: it is easier to get the debt buyer to take much less than the amount allegedly owed because it is much easier for them to make a profit . . . a really big profit! So, the example above is both a highly likely result and highly profitable business model. As such, people buy old debt. However, let's take it one step further. Debt buyers also buy debts that are not only charged off, but debts that are beyond their statutes of limitations. Statutes of limitations are the laws (different state by state) that control how long a creditor or debt buyer may lawfully collect a debt. In the state of Florida, the statute of limitations is five (5) years on a written contract and (4) years on other contracts. Back to our question: why would debt buyers buy debts that are beyond the statute of limitations?! The above example makes sense -- but to buy debts one cannot lawfully collect makes absolutely no sense, right? Not so fast. It is only unlawful to collect a debt beyond the statute of limitation if the debt buyer gets caught . . . and most do not get caught, until now. Recently, the Eleventh Circuit Court of Appeal issued an opinion in the Crawford v. LVNV Funding, LLC case that held debt buyers to file a time-barred (i.e., beyond the statute of limitations) claim in a consumer's bankruptcy have taken steps to collect a debt that runs afoul of 15 USC 1692 et seq., the Fair Debt Collection Practices Act (FDCPA). The FDCPA is a federal law that protect consumers from abusive, misleading and unfair consumer debt collection practices. Historically, District Courts have held that debt buyers and debt collectors trying to collect time-barred debts in a bankruptcy case (i.e., by filing a proof of claim, telling the trustee that the debtor owes them money) did not violate the FDCPA, but rather found the proof of claim was simply disallowed if the debtor or trustee objected to the debt buyer trying to collect the stale debt (ironically, if the debtor or trustee did not object to the proof of claim as being past the statute of limitations they would get paid). This old practice -- at least in Florida, Georgia and Alabama -- is no longer the case. Going forward, if a debt buyer files a proof of claim in a bankruptcy case in an attempt to collect a debt past the statute of limitations, the consumer has a potential FDCPA claim against the debt buyer for engaging in deceptive and/or misleading means in its attempts to collect a debt and for engaging in unfair practices in an attempt to collect a debt. 15 USC 1692e; 15 USC 1692f. Have you (or your client) Filed Bankruptcy: You May Have a Case! LeavenLaw, a law firm whose roots are consumer bankruptcy law, is currently in the process of reviewing its clients' bankruptcy files and cases to determine if there are any such FDCPA violations and, if so, whether these wrongs can be remedied on a class action basis. Currently, LeavenLaw and its attorneys have identified three clients and large, national debt buyers who seem to have engaged in such unlawful activity on, as alleged, a wide-spread basis. To see the class action complaint filed in the Middle District of Florida, Tampa Division, on behalf of LeavenLaw clients and all those similarly situated across the state of Florida, please click here: Mullins, et. al. v. Asset Acceptance, Encore Capital Group, Case 8:14-cv-03073-SCB-AEP. If a mortgage foreclosure judgment was entered against you in the state of Florida, you could be among the many Floridians and ex-Floridians facing a mortgage deficiency collections case in a Florida court. The collection of mortgage deficiencies is on the rise in Florida and there are several things you should know if you are facing lingering mortgage liability. Under Florida Statutes Section 702.06, a mortgage deficiency on a residential property in Florida is defined as the difference between the amount awarded to the bank in the final judgment of foreclosure and the fair market value of the home at the time of the court sale or short sale. As an example, assume that the Court has adjudicated that you owe $ 200,000 by virtue of your loan default and on the date of the court sale, your home has a fair market value of $ 110,000. Because the value of the property does not fully compensate the bank, the bank could attempt to obtain a deficiency judgment against you in the amount of at least $ 90,000, exclusive of attorneys’ fees and court costs. The recent trend among creditors is to package deficiency debt and sell the rights of collection to third party debt collectors. These collectors, while sometimes legitimate, often fail to comply with your rights under the Florida Consumer Collection Practices Act, Fair Debt Collection Practices Act, and the Telephone Consumer Protection Act. Unauthorized calls to your cell phone, harassing language, and false assertions of debt are just a few violations committed by these deficiency collectors that could entitle you to money and possibly provide leverage for a settlement. In addition to gaining possible claims against the debt collector, it is also helpful to develop an overall strategy to solve the debt. LeavenLaw can assist you in planning a strategy that may include: contesting elements of the bank’s case, negotiating a possible settlement, monitoring for consumer law violations, or avoiding liability through bankruptcy. If you are sued for a deficiency amount, it is a very serious situation that could result in garnishment of your money and property. To protect your interests you should seek out a firm experienced in settling deficiency debts. At LeavenLaw, we specialize in helping consumers analyze liability and strategize solutions to mortgage deficiencies. If you are facing a deficiency lawsuit, call LeavenLaw at (727) 327-3328 to setup a free consultation today or visit www.LeavenLaw.com. Why Are You Pulling My Credit? 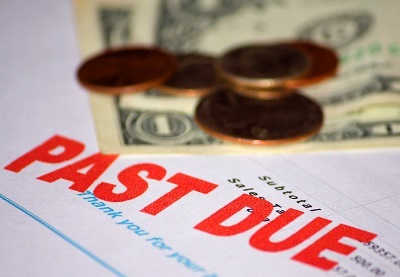 Does a Debt Collector Have to Notify You that a Debt is Time-Barred?